More Pixels… or Better Pixels? The resolution craze seems to be insatiable. From 480p SD to 720p to “Full” 1080p HD… there seems to be no end to the pixel pushing hype. Consumers and corporate marketers are driving a new push to sell Ultra 4K televisions at a time when broadcasters and local media markets have just finally settled into their 1080 HD equipment and workflows. Netflix is streaming 4K movies now. Apple has released an iMac computer with a 5K screen and their latest Mac Pro is configured to handle multiple screens of 4K video. 4K televisions are dropping in price rapidly and the market seems to be warming to another format change. 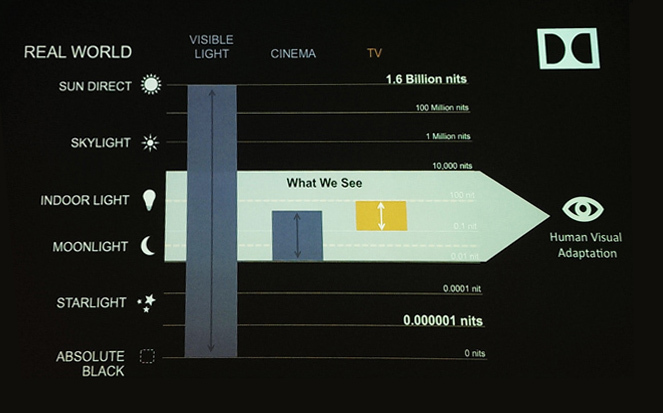 3D is still in the conversation as well as higher frame rates (for sporting events and certain movie applications). And now the subject of 8K is starting to enter the discussion. So it’s really time to stop and evaluate the priorities. Do we really want 8K? Or do we need higher quality with the resolutions we already have? There’s a great article over at Red Shark on this very topic… take a look. Dolby is marketing towards higher dynamic range in TV’s to better recreate reality.